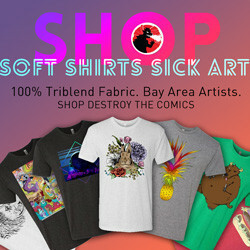 Disclosure: This post contains an affiliate link which provides a small amount of compensation to help us keep the website running if you buy through the link, at no extra cost to you. An interesting premise, We Stand on Guard features a ragtag band of brothers (and sisters) fighting for freedom against an unusual foe: the USA. 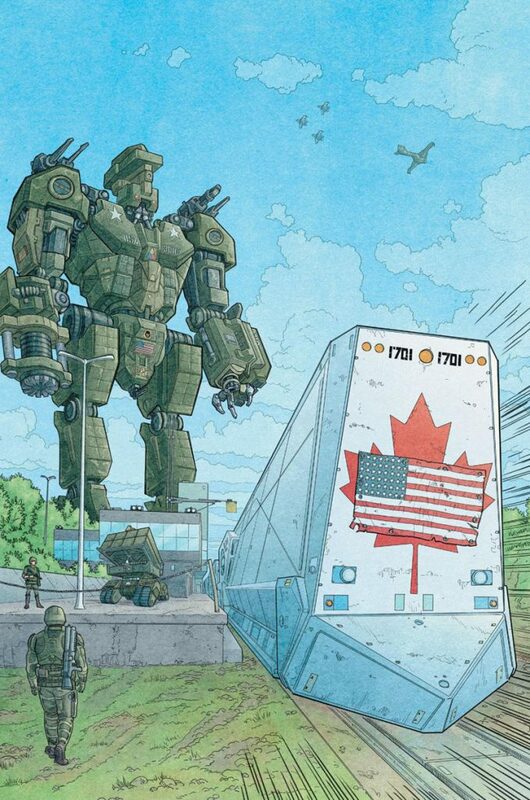 Taking place in a near future where water is a scarce resource in the United States and giant mechs form the backbone of the US military, the story tells of a Canada that has been decimated, invaded, and occupied by the US. 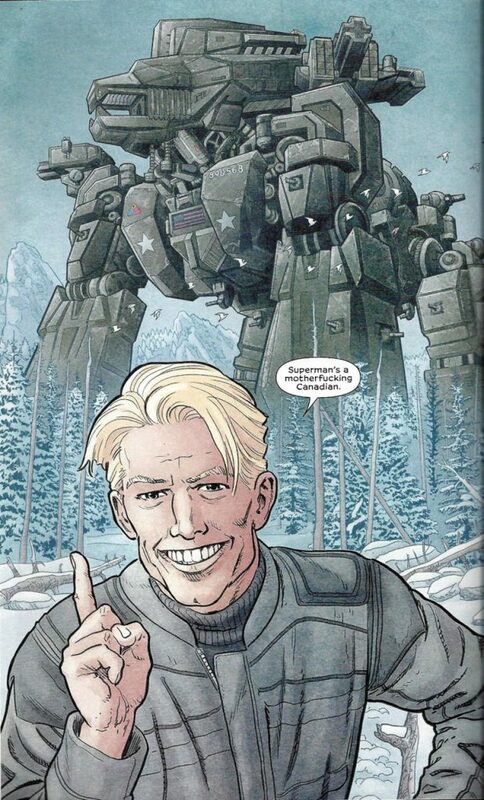 Our main characters are a group of Canadian rebels stockpiling war machines as they march toward a single, final battle against the US military. While the art has fantastic amounts of detail, especially on the machines, the character development is weak, which is a shame because it could have strengthened a plot that isn’t very memorable or unique. Though there’s interesting references to Canadian history and culture thrown in, the Canadian setting never really goes beyond window dressing. 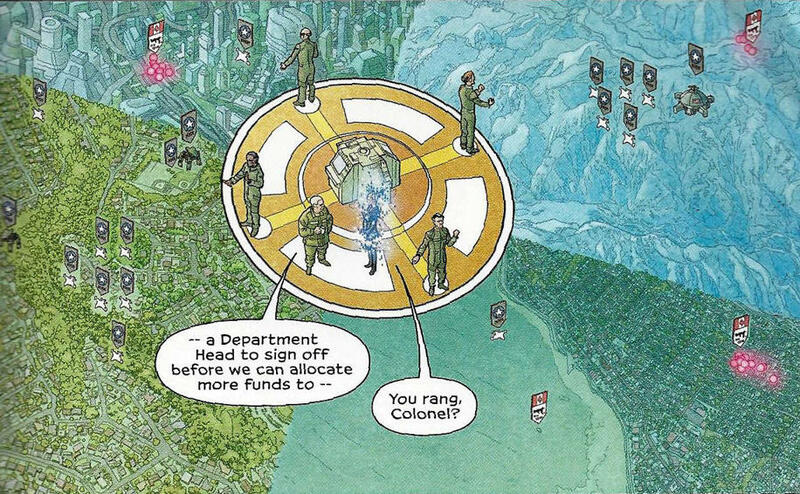 The comic’s theme is Canada, but it never satisfyingly explores the Canada-USA relationship in meaningful way that reveals any deep insights. Writer: Brian K Vaughan – Most well known for writing Saga, Y: The Last Man, and Paper Girls. Colorist: Matt Hollingsworth – Worked on titles for all the large publishers, with multiple Eisner nominations for Best Colorist. He’s also worked on visual effects for several sci-fi/fantasy/superhero films. Interesting references to little known Canadian history tidbits and cultural facets – There’s knowing nods to Canadian brands like Tim Horton’s and Eat-More candy bars, while the story gets spiced up with historical notes like War Plan Red (a US war plan for a British invasion launched from Canada), Superman’s Canadian origins, and diverse characters like the French speaking Québécois actor. 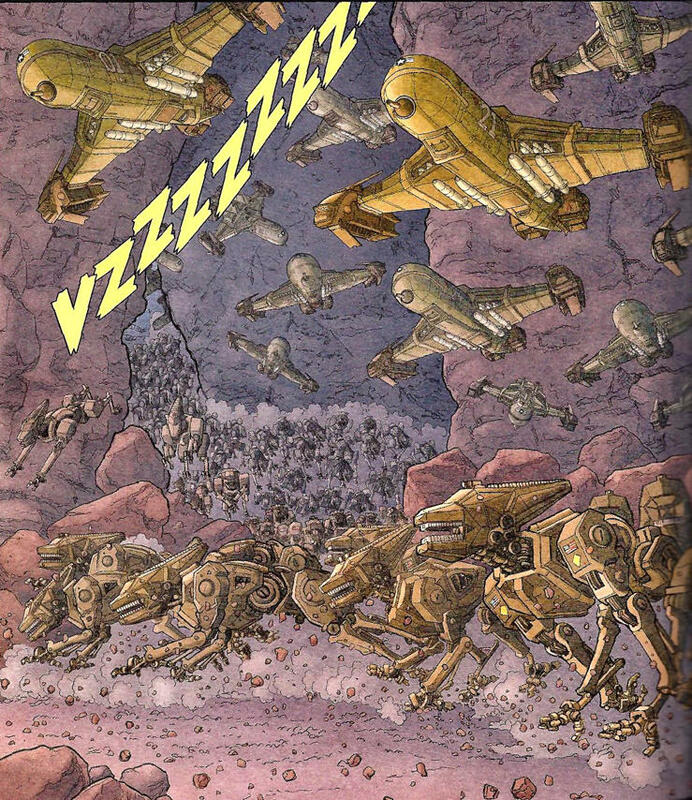 Beautifully detailed art, especially on the mechatronic war machines – Skroce’s art contains stunning amounts of detail in several panels, notably on the vehicles and the battle mechs. The designs capture well the shock and awe, high-tech armored approach that embodies US fighting doctrine. Everything looks realistically battle-worn, with an almost tedious-to-draw amount of detail. Shallow character development compounds with a somewhat generic plot, making it hard to really get into the story – Minimal, uneven character development from a over-large cast makes it hard to care about any of them. Amber, the protagonist, develops with jarring rapidity from being a rescued rookie to battle hardened leader of a suicide attack. Because the plot is a fairly standard you-killed-my-family-now-I-kill-you/Dirty Dozen war story, it would have benefited from more memorable characters or execution to hold reader interest. There’s a lack of insightful exploration of Canadian themes or the US-Canada relationship, so it feels almost like watching a bland Hollywood war movie–big budget action, cliches, and not much else. Sure, you have the US’ “we’re the good guys” platitudes depicted and a final-stage reveal that Canadian forces actually attacked the US first, but it doesn’t add much meaning. The final victory rings especially hollow because the rebels win by poisoning all of North America’s (including Canada’s) water supply. I guess the message is everyone is fucked? Robodog drones–makes you think of the new Wolfenstein doesn’t it? 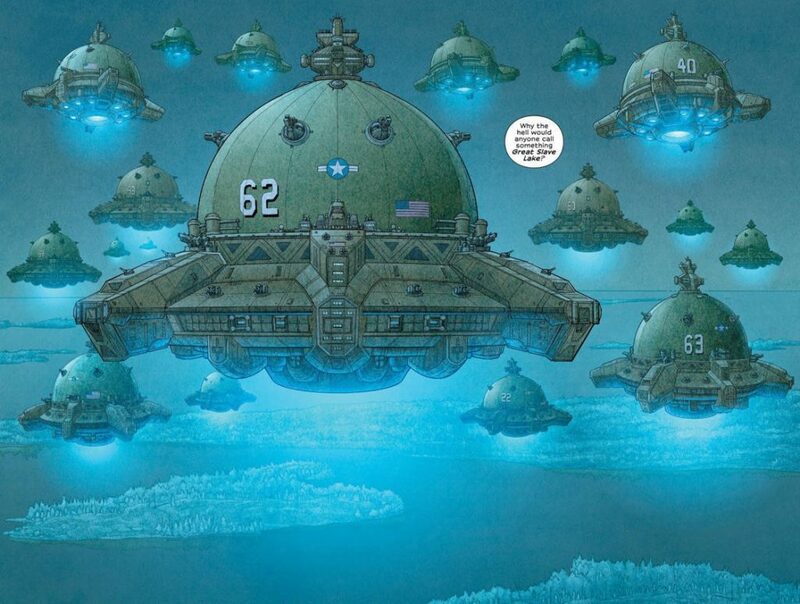 US overwhelming forces doctrine: aerial war fortresses that look like a cross between a leviathan, a jellyfish, and a UFO. Drawing this one panel looks like it would give me carpal tunnel syndrome with all those little details drawn in there. This review is part of the Quick Reviews series. Quick Reviews are concise with standard formatting (and spoilers) that you can read in a about minute to get the gist of our thoughts.